Prescriptions may also be submitted to an online pharmacy, which may offer better prices. However, there are many fraudulent pharmacies online, which may sell counterfeit drugs. According to the FDA, 97% of online pharmacies reviewed by the National Association of Boards of Pharmacy are not in compliance with U.S. pharmacy laws and practice standards1. Many people in the United States now buy prescription drugs from Canadian pharmacies. But bear in mind that many pharmacies claiming to be in Canada are not! 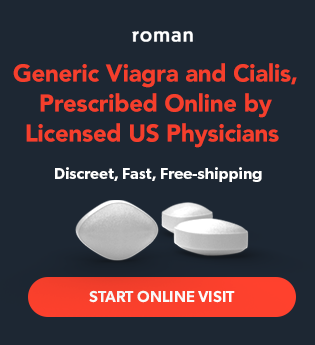 If you are looking for a trustworthy, US-based online pharmacy for purchasing ED medications, we recommend Roman. Check for logos indicating accreditation by LegitScript, Verified Internet Pharmacy Practice Sites (VIPPS), Accreditation Commission for Health Care (ACHC), or URAC. Click the logos to make sure they are actually linked to accreditation, and not just copied and pasted on a fraudulent website. Check official government registries to see in the pharmacy is listed. In the United States, check the FDA BeSafe registry. In Canada, check the Canadian International Pharmacy Association. In the United Kingdom, check the MHRA Registry. Avoid pharmacies that do not require a prescription! Check the website to be sure they list an actual street address somewhere on the website. Do not order from pharmacies outside of your own country. Pharmacies that ship across international borders know that you have very little legal recourse if you have problems. Do not deal with pharmacies if their prices seem too good to be true. Do not deal with pharmacies that do not have a licensed pharmacist available to answer your questions, either by phone or online. You will find that many supposed US or Canadian pharmacies are actually in eastern Europe or Asia!